Here is a list of Best Free Movie Catalog Software For Windows. These Movie Catalog software let you manage your collection of movies easily. All these Movie Catalog Software are completely free and can be downloaded to Windows PC. These Personal Movie Database Software have various features; some let you add movies to the database by giving source file/folder path. Most of these can fetch the movie information from the web (IMDB, The Movie DB, Amazon Movies etc.). 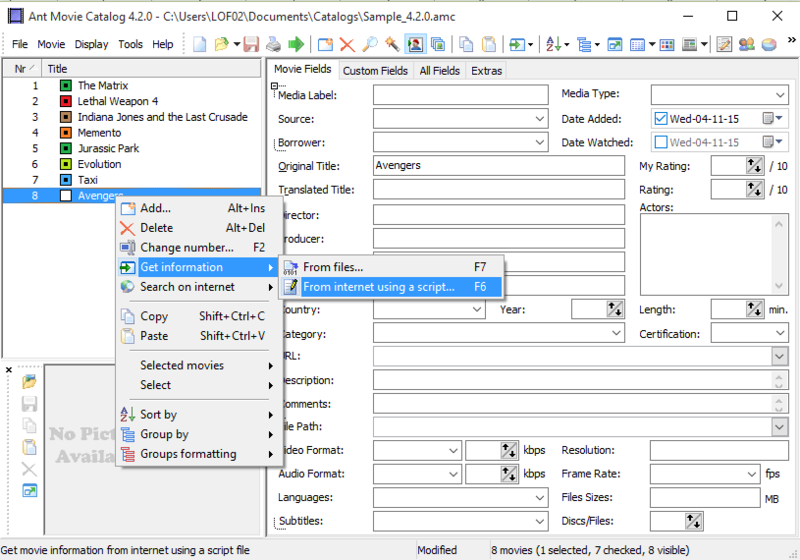 In my opinion Ant Movie Catalog is the best movie catalog software as it has various useful features including database printing by using various predefined templates. You can also try these best free Sandbox Software, Contract Management Software, and Library Management Software. Ant Movie Catalog is a free and easy to use Movie Catalog Software. 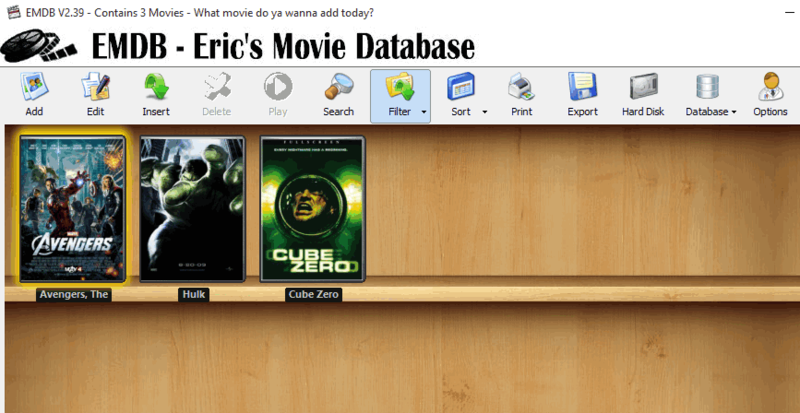 It lets you create and maintain your own personal movie database. You can import list of movies from various sources like CSV/Excel, MS Access Database, DVD Profiler (XML Report), Local Media Files etc. Movie Length, and many more. You can take Printout of the complete database or of selected movies. For this it has various predefined templates and you can choose the desired one from the list and take Printout. CD/DVD Covers can also be printed by using these templates. After finishing you can save the database in its native AMC format or in XML format. Supports both physical discs and media files stored in a folder. Supports multiple language user interface. Export movies list to CSV, TXT, HTML format. Support for Database Export and Printing. Changeable Skins, and many more. The program is available in many languages including: English, Dutch, French, German, Hungarian, Japanese, Polish, Italian, Portuguese, Spanish, Russian, Simplified Chinese, Traditional Chinese, etc. My Movie Library is simple and easy to use Media Manager Software. You can add any movie manually by typing or by adding a folder containing movie(s). It then lets you search for the found movie titles on IMDB. After getting the IMDB Movie name, you can add this info to the database. It shows the movie detail in the tabular format (in various columns). The column headers are: ID, Name, Release Year, Genre, Rating, Actors, Director, IMDB ID, Duration, Added, Times Played, and many more. You can enable/disable columns of your choice. You can anytime search your database for any particular title by using its search function. You can play any movie in your library by clicking "Play Movie" button. In my testing, the program retrieved the information of movies from IMDB but failed to get the cover art. Personal Video Database is another free Movie Catalog software in the list. It is a bit different from similar movie cataloging software. It fetches the info of a movie from the internet and saves to its database. You can apply this info to a particular movie file by specifying Target Folder. It has both import and export database features. You can import the movie info from various movie database websites while its export feature lets you to save the database in various formats, including TXT, CSV, HTML, HTML Table, Simple Page List, XML and many more. Filmotech is a free movie catalog software. You can add movies from any folder to its database for your reference. After adding the movie to the database, you can update its information from the web also. If you have a huge movie database, then you can find any particular movie by using its inbuilt search function. You can mark any movie seen/not seen as per your choice. You can also lend any movie to your friend and it also has an option to store "lend date" and "lend to" info in its database. You can watch online trailer of any particular movie in the list by clicking "Show Trailer" button in the movie description page. You can print the movie info as well as its poster if required. 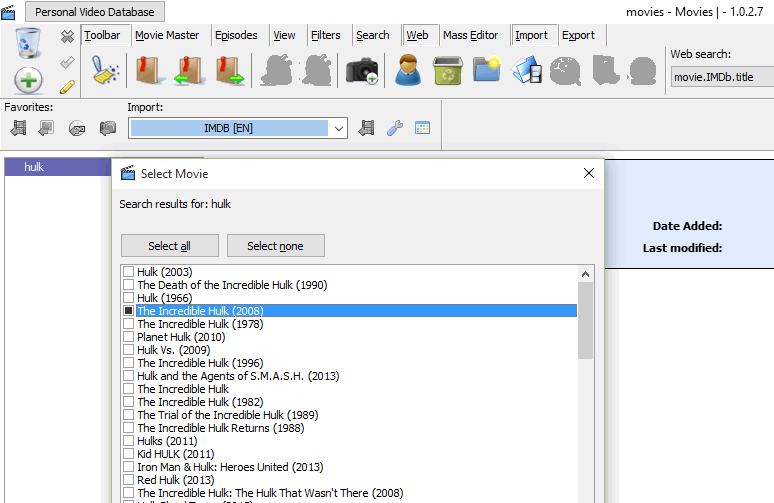 moVee 8 is a free and easy to use Movie Catalog Software. On its main page it basically shows you the latest "BOX OFFICE", "COMING SOON", and "TRENDING" movie details from the TMDb website. It also lets you keep track of your movie collection by providing the related info from the web. It has an easy to understand user interface. It fetches the detailed info about any movie in your collection from the web automatically. You just have to add the movies from a folder by clicking "Browse For Folder" button on its main interface. 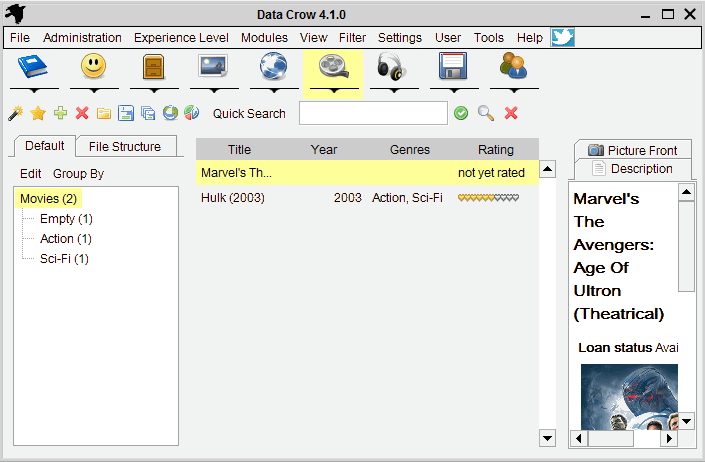 Data Crow is an advanced cataloging utility which lets you make catalog and manage database of various types of collectable items. Example of these items are: Books, Contacts, Containers, Images, Media, Movie, Music Album, Software etc. You can use it to manage your movie collection easily. When you run this program first time, it asks you to set the working directory for current user and also lets you choose the program interface language. You can easily add new item by clicking the right module (in our case: Movies). It can retrieve the movie detail from various popular websites, like: IMDB.com, ecs.AmazonWS.com, TheMovieDB.org and many more. You can manually search for a particular title also by typing the name in the "Search for" box. After adding the movies info to your database you can click "Save all items" button to save the collected info. 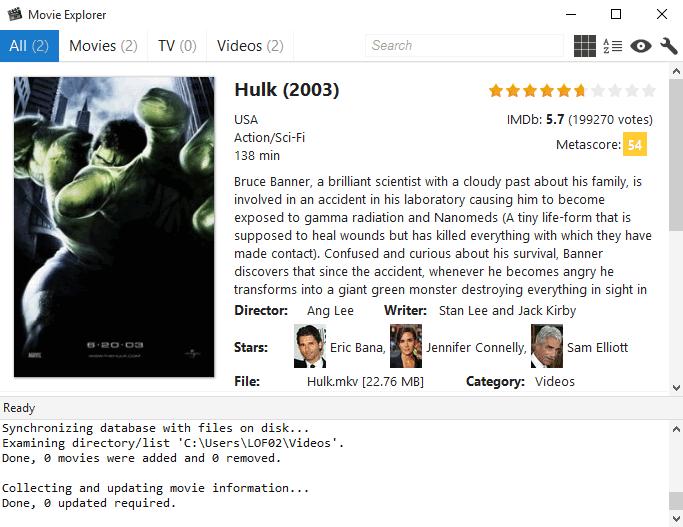 Movie Explorer is a simple and easy to use movie cataloging program for Windows. The program is portable and doesn’t require installation. It displays the information about the movies you have in your collection. Put your movies in the default "Videos" folder. For e.g. "C:\Users\user_name\Videos". It then automatically fetches the corresponding movie information from IMDB website and adds it to database automatically. You can play the movie with your default media player from the movie information page by clicking the respective play button. jMovieManager is very useful software for managing your personal movies collection. It is a Java based portable software. Just execute the JAR file and you are ready to use this nice movie manager. 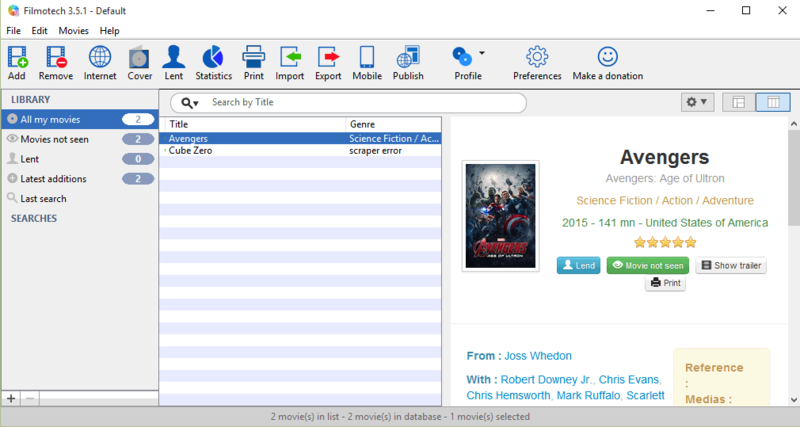 You can add movies to its database by adding movies from a particular folder. After adding the movie to the collection, you can search its title for online info. After adding the information to the database you can save the database in the desired location. It fetches the movies info from themoviedb.org website. It has a Calendar view and you can see the posters of "Upcoming Movies", "Currently in Cinema", and "Top Rated" movies. 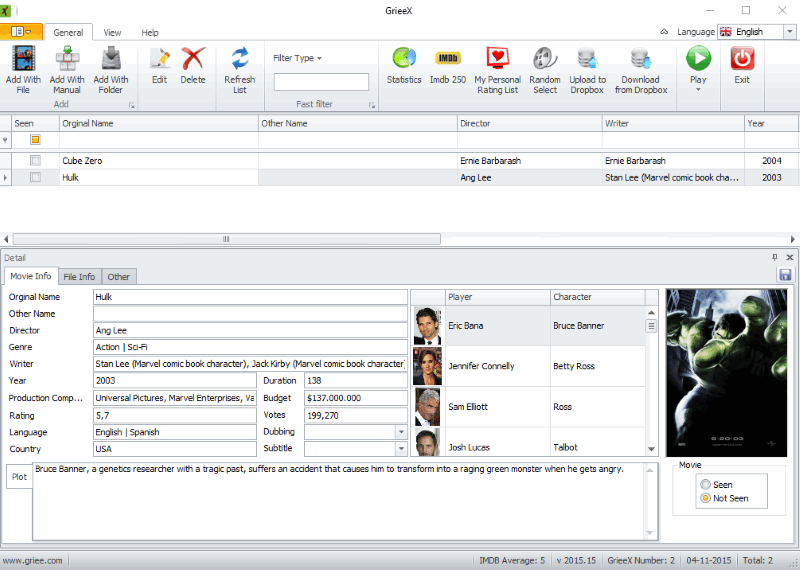 GrieeX is an easy to use Movie Cataloging Software. If you have a huge collection of movies then managing them is a tricky work, so you need a software like this. You can add movie to its database by using any of the following option: "Add With File", "Add With Folder", or "Add With Manual". It can fetch the info of any movie from IMDB or TheMovieDB website and based upon the found info you can save the details. You can play any movie in your database with a default media player by clicking the Play button on its main toolbar. The program can upload the database to your Dropbox account also. MoviePly is a bit different type of movie organizer software. It lets you add movies to its database by using drag and drop feature. You have to drag and drop files or folders to its interface to add them to its database. It then fetches movie information from the web based upon the file name. If you have a huge collection of movies then you can use its search box for any particular title. 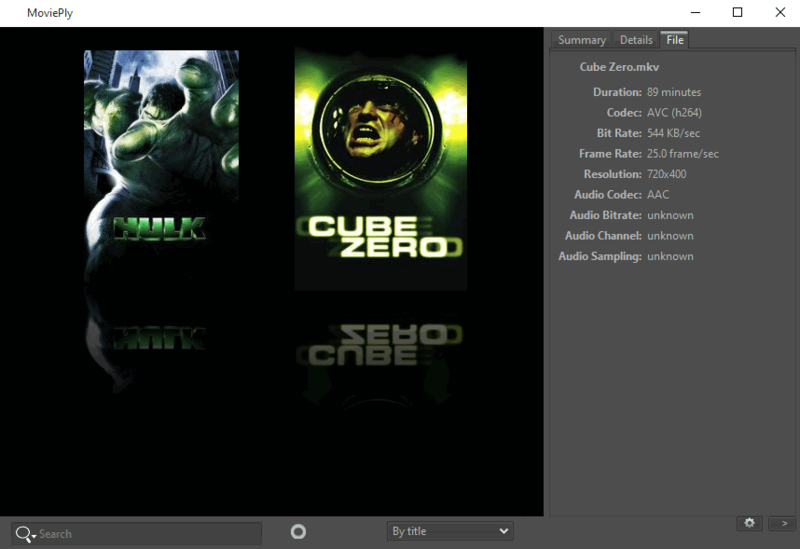 You can also play any particular movie by double clicking on its poster with the default media player. MediaMonkey is a media player as well as media manager. Its free version has various useful functions for managing media files. After adding files to its library, you can find the media info form the internet. Its auto tag editor also let you view and save the info of any video file from the web. The program comes in installable version but at the time of installation you can install it as a portable media player also. The program works with audio files also, but as we are dealing with video files so only these are considered in my testing. You can rate any item in the list from 0 to 5 for your reference. 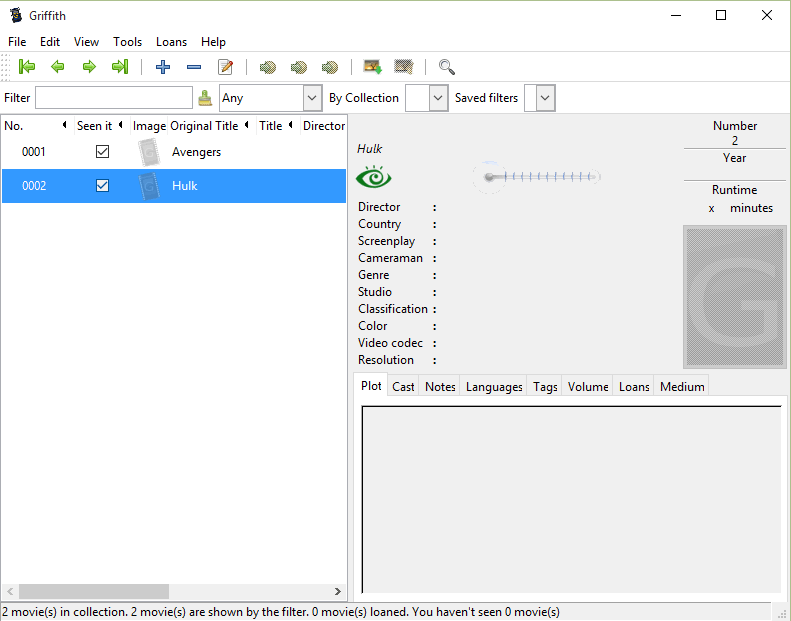 Griffith is a free and easy to use Media Collection Manager. 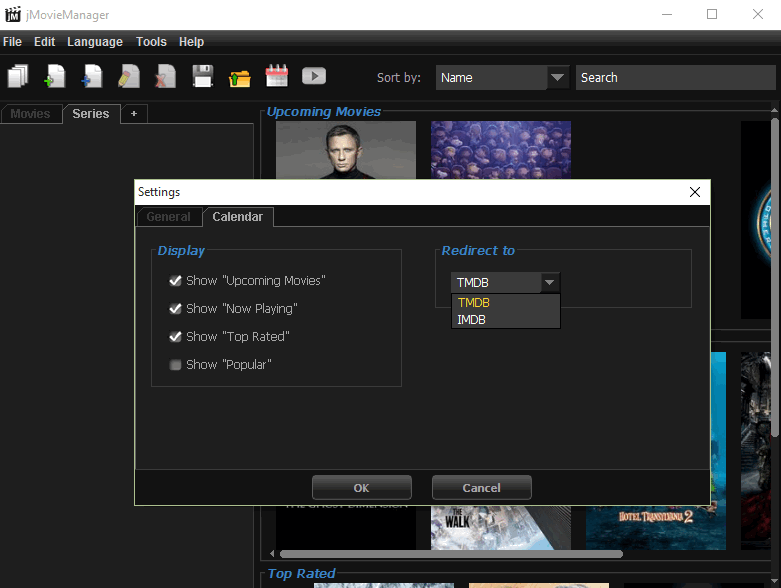 You can add movies to its database by typing the movie name and other details related to the particular movie manually. You can regularly create backup of your Movie Database in the desired folder. It says that it can fetch the movie information from the web, but in my testing this feature didn't work. So if you want to make and maintain your movie collection manually, then this a good software. 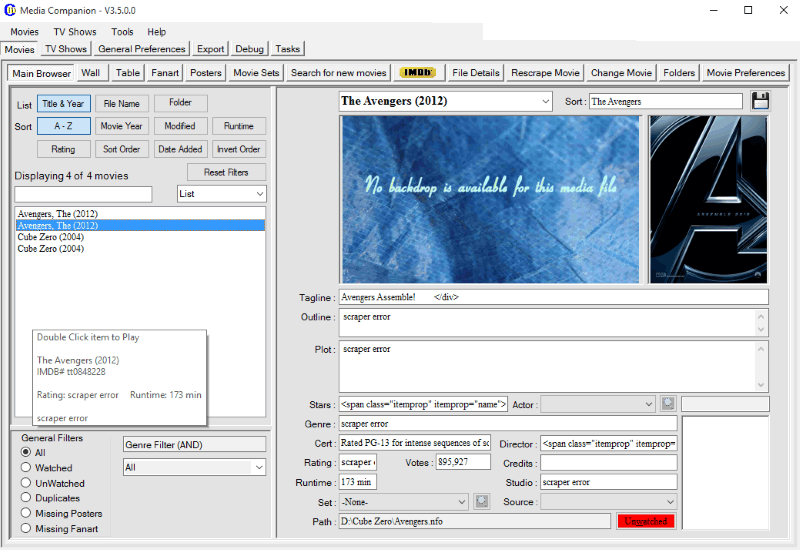 Media Companion is another Movie Manager Software which lets you manage your movies collection in database format. You can add the movie title and it will fetch the rest of the details from the internet. It supports Movies as well as TV shows. You can also search for new movies through it. You can add offline movie folders to its list to include them in its database. In my testing it partially fetches the movies info from the web, otherwise it is a good program. 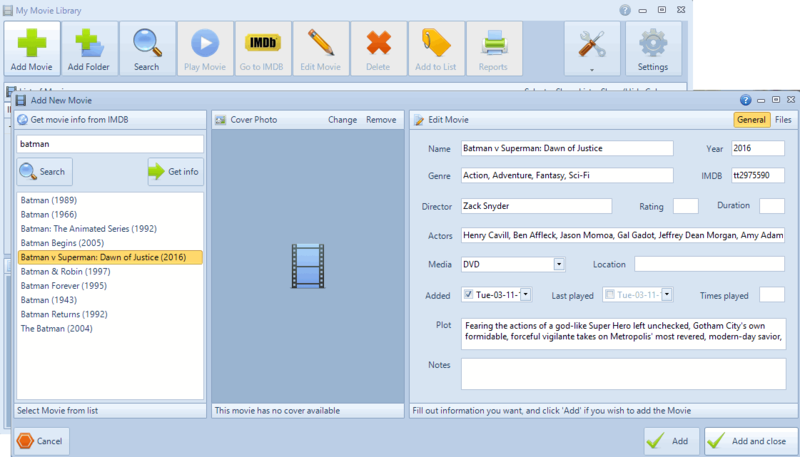 MeD's Movie Manager is a free Movie Manager Software. It lets you create and maintain database of your offline movies. You can add folder containing movies to the database by providing the path to the program. It can fetch movies information from online services like IMDB, but in my testing this functionality didn’t work. Users can manually add movies to the database too. The program comes in various installation modes including Cross Platform Installer.